Looking for something extra sweet to add to your holiday dessert table? I have just the pie for you: Dutch Apple Pie. This is one of my absolute favorite pies. 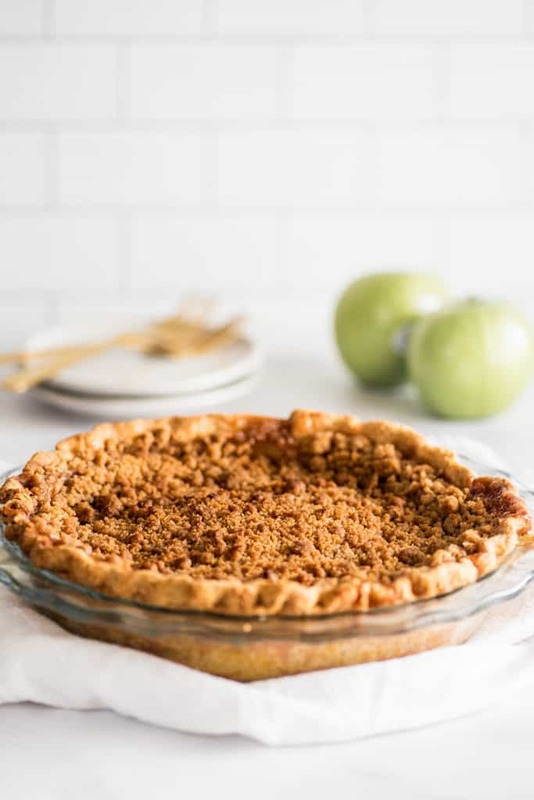 Sweet and tart apples piled with an absurd amount of crunchy, crumbly brown sugar cinnamon topping and baked into a flaky pie crust. It’s a total show-stopper AND incredibly easy to make. For the full, printable recipe, scroll right down to the recipe card. If you want me to walk you through the pie-making process with some tips and tricks, read on. 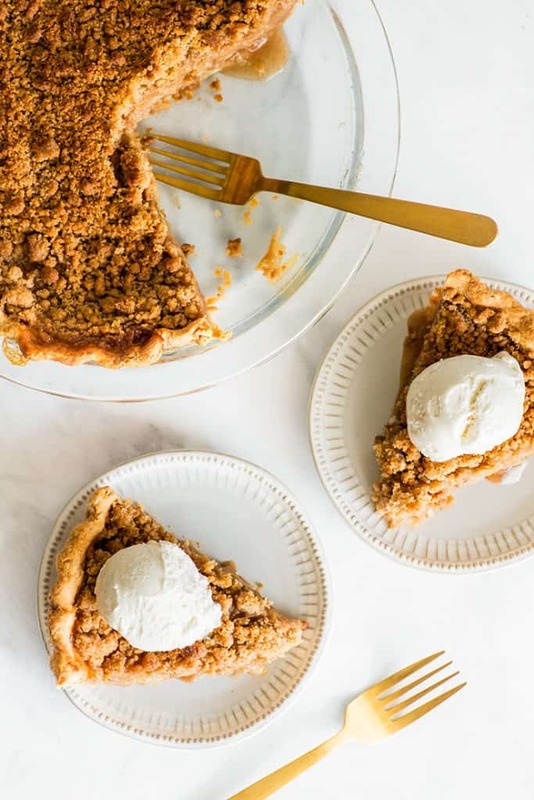 Oh, and if you don’t feel like making the crust from scratch, a frozen store-bought crust absolutely works just as well, and you still totally get pie-making bragging rights. Once your crust is sorted, time to make the crumble topping. You’ll need cool room temperature butter, flour, brown and granulated sugar, and cinnamon. A note on butter temperature: During the cooler months of the year, just set your butter out on the counter to soften an hour or so before you’re ready to get started, but if you’re making this pie during the summer, keep an eye on your butter temperature and don’t let it get too soft. Butter that’s too warm and melty will be difficult to work with. 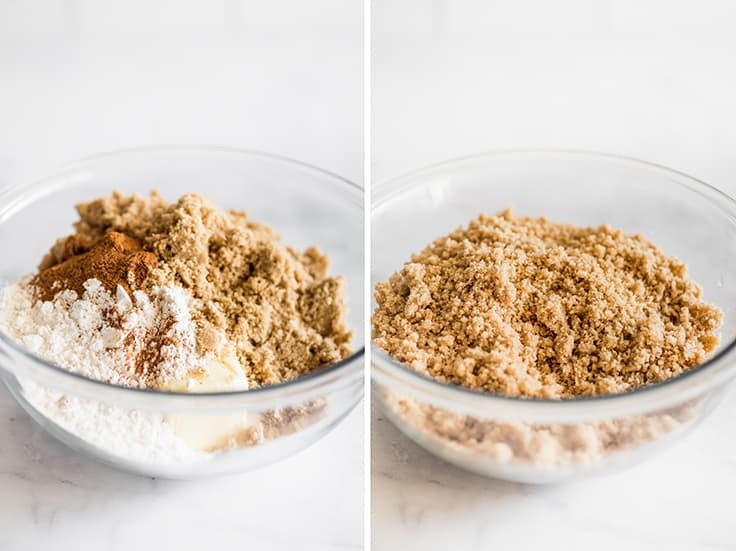 Take all your crumble ingredients, dump them into a large bowl (the bowl in these photos was actually a little too small for this) and use a fork or clean hands (I always use my hands) to mix until well-mixed and crumbly. Put your crumble in the fridge and it’s time to make the filling. Peel and thinly slice your apples. I use and recommend Granny Smith Apples for this pie. They hold up well to baking without becoming mushy, and their tartness offsets the sweetness of the crumble nicely. You can use whatever baking apple you prefer, but a purely sweet apple will make this (already very sweet pie) very, very sweet. 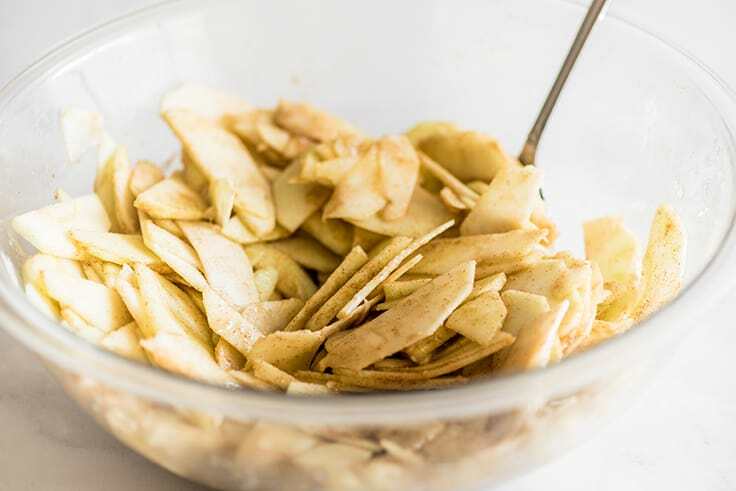 Toss your apple slices with lemon juice, brown and granulated sugar, flour, cinnamon, salt, and a pinch of nutmeg, and then layer them into your unbaked pie crust. 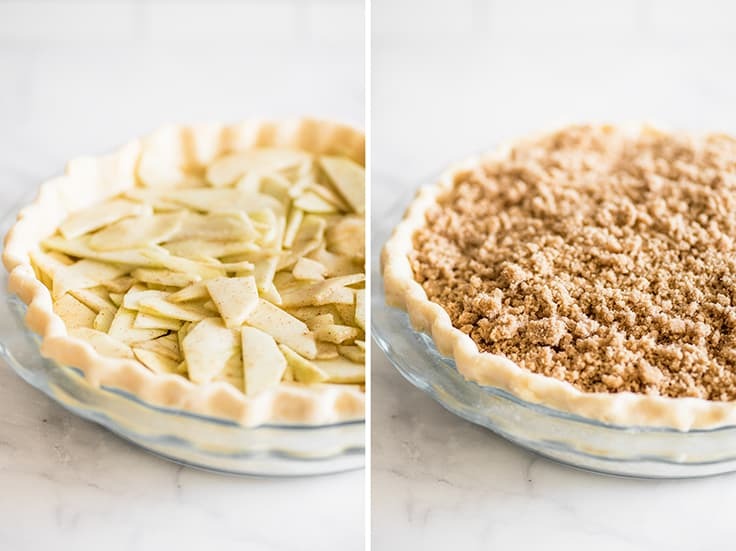 You don’t need to perfectly stack each slice, but the flatter and more evenly the apples are layered, the less likely you are to have parts of your pie sink during baking. Depending on how shallow your 9-inch pie pan is, you may have slightly too many apples (the pie dish in these photos is quite deep so everything sits level). Mound them as high as you like as long as there’s room for the crumble. Finally, add the crumble. It will seem like a lot, but the crumble is the best part, so if it fits in the pie pan, use it. To avoid drips in your oven, if using a metal pie pan, set your pie on a foil-covered baking sheet. For a glass, pyrex, or ceramic pan, set the sheet on the rack below. This pie starts at 425°F to help the bottom crust set quickly (no soggy bottoms here) and then drops to 350°F for the remaining cooking time. Keep an eye on your crumble during the initial high-heat cooking time, especially if it’s mounded high, and cover the top with a small piece of foil if any of the sugar begins to burn. Later in the baking process, you can cover the entire top of the pie with foil if the crust or topping is browning too quickly and looks like it might burn. The pie is done when it’s bubbly and you can insert a knife into the center and feel that the apples are softened all the way through. Cool for at least half an hour then serve with a big scoop of ice cream and enjoy! Whole Pie: To reheat a whole pie, bake for 20 to 30 minutes at 325°F. Slice: 10 minutes at 325°F for a slice or about 30 seconds in the microwave. If you’re a fan of Marie Callendar’s French Apple Pie, and looking to recreate it, this is not an exact replica, but it’s pretty close to it. 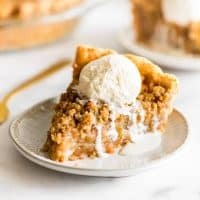 It’s not as tooth-curlingly sweet (not a knock, I love their French Apple Pie) and doesn’t mysteriously turn liquid when you reheat it (tell me this has also happened to you! ), but it hits all the same sweet spots. This pie will drop slightly as it settles and cools. Expect it and don’t be alarmed. This is normal! Looking for more apple desserts? Try my Dutch Apple Galette, Apple Hand Pies, and Apple Pie Bars. In a large bowl, combine all topping ingredients and use a fork or clean hands to mix ingredients until well-mixed and crumbles form. Place in the refrigerator. In a large bowl, combine apples, lemon juice, both sugars, flour, cinnamon, salt, and pinch of nutmeg. Toss until well-mixed. Layer apples in the prepared pie crust. Slices don’t need to lie completely flat, but the more evenly they’re layered, without any air pockets, the nicer your layers will look when cooked and the less likely your pie is to sink in places. If using a shallow pie pan, you may have slightly too many apples. Fill crust until gently mounded. Top apples with crumble topping, fitting as much of the crumble into the pan as possible. Line a baking sheet with foil for easy cleanup. If using a metal pie pan, set your pie on the baking sheet and place on the center rack in the oven. If using a glass, ceramic, or pyrex dish, place your pie on the center rack and the sheet on the bottom rack. Bake at 425°F for 15 minutes. Keep an eye on your crumble and tent the top with a small piece of foil if the sugar begins to burn. Turn heat down to 350°F and bake for 45-55 minutes. Cover the top of the pie with foil if at any time it begins to brown too quickly. The pie is done when you can insert a knife into the center and feel that the apples are cooked through. Cool for 30 minutes and enjoy or cool completely and store covered at room temperature. To reheat, bake at 325°F until heated through (20-30 min). 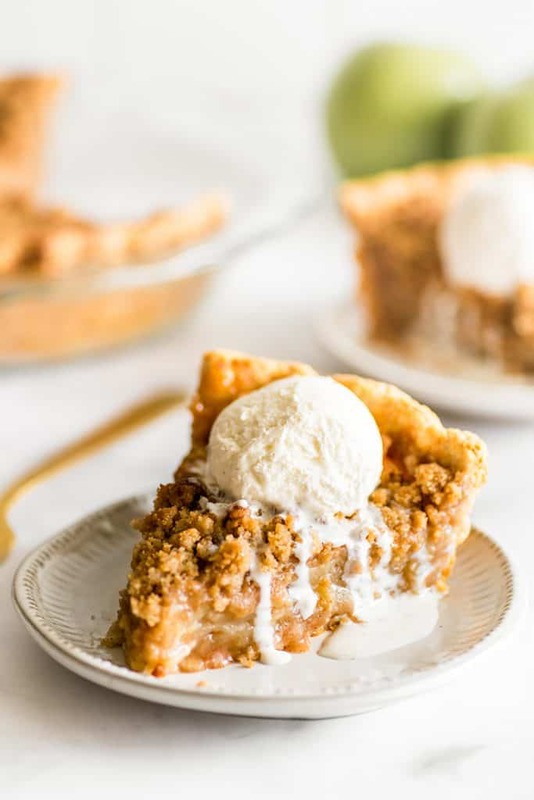 *If using pre-made frozen pie pie crust, allow the crust to sit at room temperature while you make the rest of your pie so it has time to thaw. *If using a very deep 9-inch or a 9 1/2-inch pie pan, use 8 1/2 cups apples (you don't need to increase the rest of the filling ingredients).